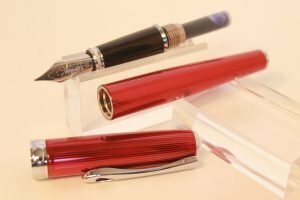 Since they were founded in 1988, Visconti has been at the forefront of design and innovation for fine writing instruments and watches. Many of their products are functional pieces of art, meant to inspire and wow every time they are seen and used. 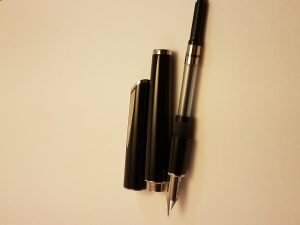 My review today is of the Visconti Pininfarina Disegno fountain pen in black with a Smartouch nib in Fine. 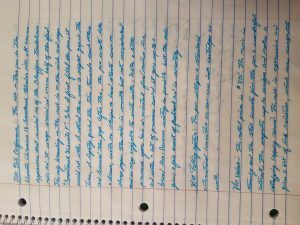 This is one of my first experiences using a Visconti pen. 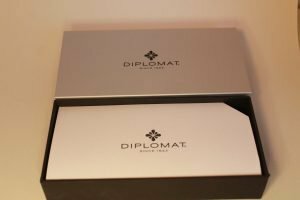 9/10 Packaging: The outer box is light beige with the Visconti Firenze logo both in the center and on the box flaps. 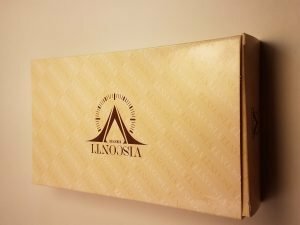 There is a diagonal design repeating across the box with the word Visconti in alternating white and brown print. 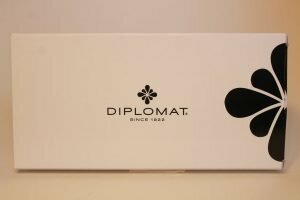 One box flap has a sticker with the model, color, writing mode, and nib size on it reading, “Pininfarina Disegno Black Fountain Pen F”. 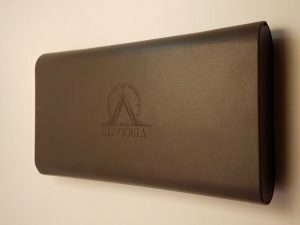 Inside this box, is a dark leather clamshell box with a magnetic closure and an Visconti Firenze logo embossed in the middle of the box and on the inside of the lid. 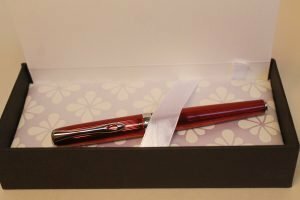 The pen is inside a plastic sleeve that says, “Made in Florence Italy”, and is clipped in place on a bed of soft white leather. A serial numbered information booklet containing company information and product photos is included, as well. 8/10 First Thoughts: The design of the packaging ensures you know this is not an ordinary product and it feels like a luxury item. The contrast of the black pen on the bed of white leather really makes the pen design pop. 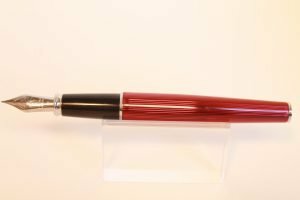 9/10 Design: The pen is a combination of beautiful black glossy resin with steel accents. Weighing in at 35 grams, it might be a bit heavy for longer writing sessions. The overall design definitely takes inspiration from its namesake and their history with Ferrari, and it looks like a racecar in your hand. 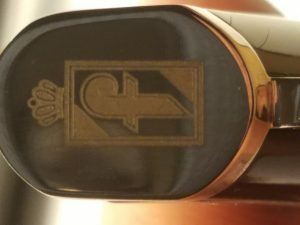 The cap finial has a slant to it, which looks like the sloped hood of a racecar, and the letter “F” engraved, which I believe is either for “Firenze” or for “Farina”. The cap is black like the body, but has a raised emblem with the words “Pininfarina” engraved on both sides. The clip’s shape is inspired by the well-known Ponte Vecchio bridge with “Visconti” engraved on both sides. 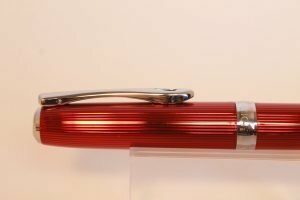 This model does not have the normal “Hook and Latch” cap closure that many Visconti pens have, but instead has a magnetic closure. The magnet is strong enough to keep the cap tightly on, but light enough to remove the cap one-handed. You can post the cap, but it makes the pen back weighted due to the amount of steel accents on the cap. 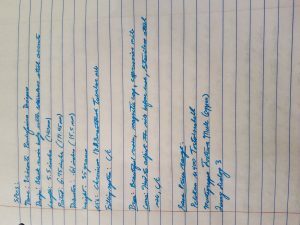 7/10 Nib Performance: The nib on this pen is the Visconti Chromium 18 Smartouch tubular nib. 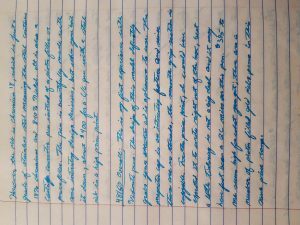 It has an appearance that reminded me of the Sheaffer Touchdown nib, as it wraps around and covers half the feed. 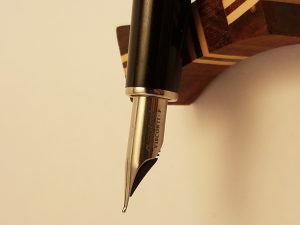 The only branding on the nib is on its side, which says “Smartouch Visconti F”. 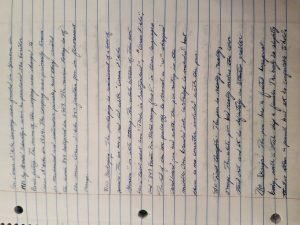 When I first filled the pen, it would not write. After noticing there was a slight gap in the tines, I lightly pushed the tines towards each other and lessened the gap. 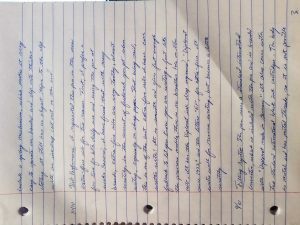 After this, the pen wrote like a dream with no skips or hard starts, even on cheap paper. 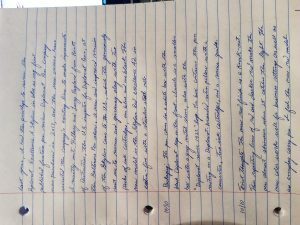 The nib is smooth, but not over polished and is very enjoyable to write with. 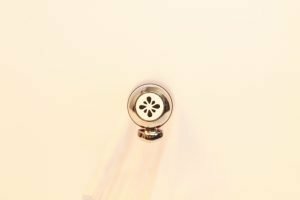 With little pressure, you have a consistent fine/medium line and with a little added pressure, it increases to a broad line. 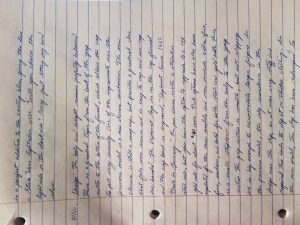 Reverse writing is possible, but the nib gives a fair amount of feedback and is scratchy. 8/10 Filling System: The pen utilizes either a standard international converter or ink cartridges. 7/10 Value: The retail price is $395. 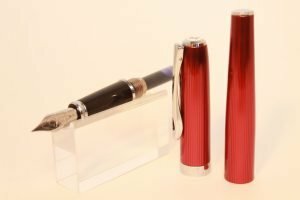 The resin is stunning and the steel accents give the pen a wonderful contrast. The magnetic cap is unique and makes a satisfying capping sound. The nib is expressive and gives a bit of line variation, which was unexpected. However, the nib is Chromium 18, which is a grade of stainless steel containing 18% Chromium and 8-10% Nickel. It is also a cartridge converter pen instead of a piston or power filler. 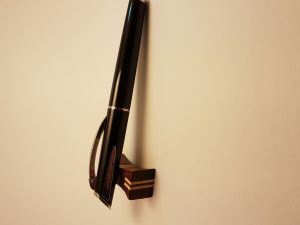 The pen is beautifully made with some interesting design decisions; however, when you boil it down, almost $400 for a c/c pen with a steel nib is a high price point. 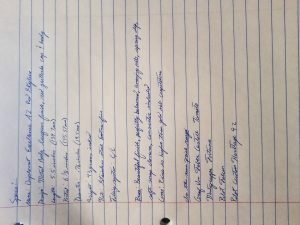 48/60 Overall: This is my first experience with Visconti pens. The design of this model definitely grabs your attention and is a pleasure to use. The magnetic cap is an interesting feature and since there are no threads, the smooth grip section is enjoyable. For the price point, I would have expected it to write right out of the box. But a little tinkering is not a big deal and it may have just been a QC miss on this specific pen. $395 to me seems high for what you get; there are a number of piston filled gold nib pens in this same price range. 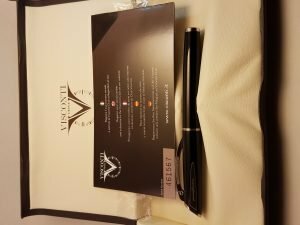 Check out the Visconti Pininfarina Disegno Fountain Pen here. The Caran d’Ache company was founded in Geneva in 1915 by Arnold Schweitzer after he purchased the Ecridor Pencil Factory. The name of the company was changed to Caran d’Ache in 1924. The company was primarily known for mechanical and watercolor pencils, but they created the iconic 849 ballpoint in 1969. 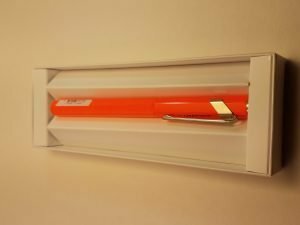 The review today is of the new Caran d’Ache 849 fountain pen in fluorescent orange. 8/10 Packaging: The packaging is reminiscent of a box of pencils. 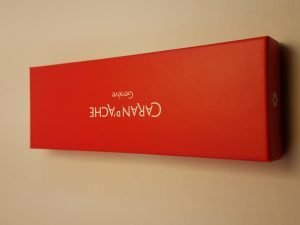 The box has a red lid with “Caran d’Ache Geneve” in white lettering. The white bottom of the box has a label that has “Made in Switzerland”, “Caran d’Ache”, and “849 Fount. 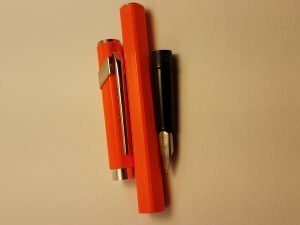 Pen metal orange fluo F” in three languages. The lid of the box pulls off to reveal a W-shaped cardboard pen bed with the pen resting in the middle. One branded ink cartridge is included; however, there is no converter included with the pen. 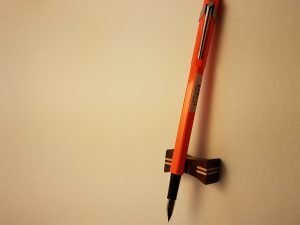 8/10 First Thoughts: The pen is really, really, orange. 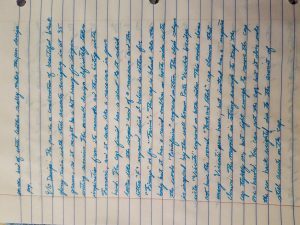 The white pen bed really makes the color stand out, and it is definitely an attention-grabber. 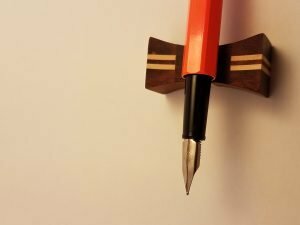 7/10 Design: The pen has a faceted hexagonal body, with a steel clip and finials. 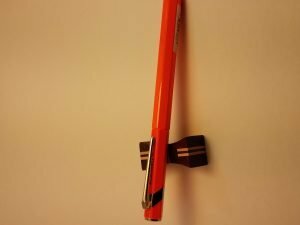 The body is slightly thicker than a yellow #2 pencil, but is comfortable to hold. 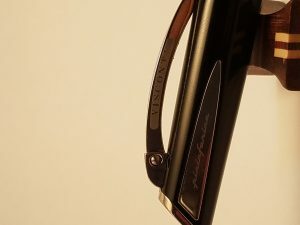 There is a small stamp in black above the clip that says “Swiss Made” and another stamp in black under the clip the reads “849 Caran d’Ache”. There is a sticker on the end of the pen with the letter “F” for fine point and the barcode for the pen. The cap snaps securely, but spins freely once closed or posted. 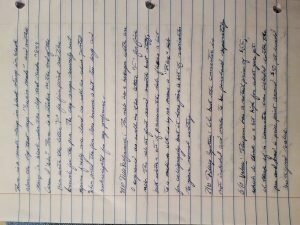 When posted, the pen becomes a bit too long and back weighted for my preference. 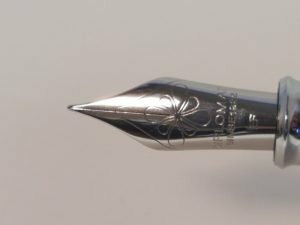 8/10 Nib Performance: Engraved on the nib are a hexagon with an O, as well as the letter “F” for fine nib. 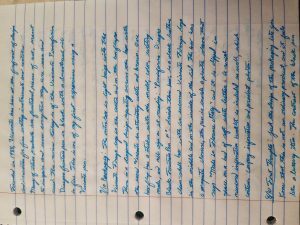 The nib at first seemed smooth and stiff, but with a bit of pressure the nib flexes a bit to a medium. It is by no means a “Flex” nib for calligraphy, but it does give a bit of variation to your normal writing. 7/10 Filling System: C/C, but the converter is not included and needs to be purchased separately. 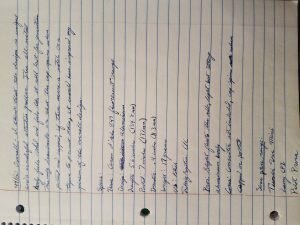 6/10 Value: The pen has a retail price of $65, which I think is a bit high for what you get. I think if a converter was included with the pen and it had a price point around $50, then it would be a good value. 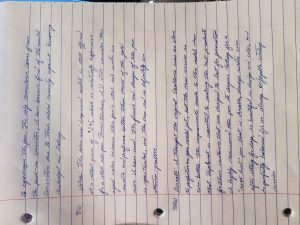 44/60 Overall: I think the design is unique and a wonderful attention grabber. The all-metal body feels solid as if it will last for generations. The only drawbacks are that the cap spins when posted and capped; if there were a notch or a taper to prevent this, it would have improved my opinion of the overall design. Pros: Slight flex to the nib, light but strong aluminum body. Cons: Converter not included, cap spins when capped or posted. 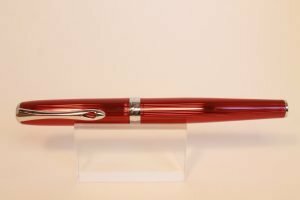 Check out the Caran d’Ache 849 Fountain Pen here.